A is for Awkward is a book centered around the importance of gaining healthy self-esteem and helping teens realize that they’re not alone. It’s a book of encouragement and real world advice written in a relatable style that resonates with teens. Every page has a letter of the alphabet paired with a unique work of art and a word that is discussed in a paragraph below. Topics from the importance of understanding puberty to the power of relationships are just a few examples of the significant subjects discussed in A is for Awkward. At the end of the book there’s a list of resources including helpful phone numbers and websites available for teens. The goal of A is for Awkward is to help middle school students feel comfortable in their own skin, addressing various topics providing advice, encouragement, and resources they can use. The book was written and illustrated by older teens for younger teens, demonstrating how youth can and will make a difference in society. This book explores those ever so dreaded awkward years and how one can turn their middle school experience into positive stage of gaining self-esteem, developing healthy relationships, and encouraging one another. 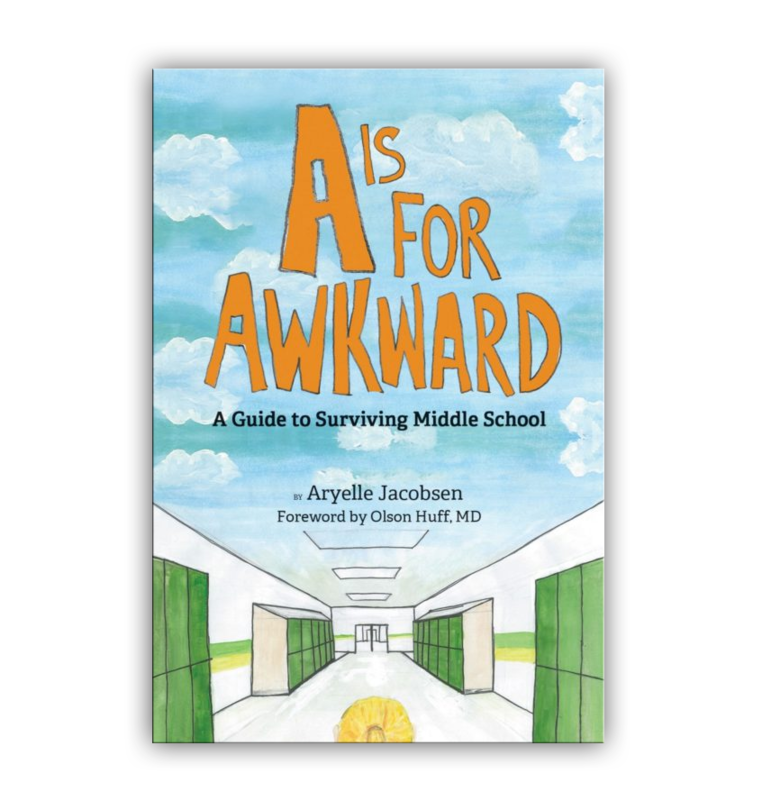 A is for Awkward shares relatable stories and advice to help teens gain the confidence they need in order to thrive. Healthy self-esteem begins with loving and accepting yourself as well as others. This book provides great insights to help kids develop into the gifts to the world their suppose to be. Knowing that one can get through those hard times is a critical thing for middle school students to understand. The advice provided in A is for Awkward allows for teens to see that this too shall pass. Being resilient always pays off and will help people their whole life. Let's be real - middle school is a dreaded and awkward time for most; however, making the best of your experience and showing kids that they’re not alone in how they feel are important topics discussed in A is for Awkward. Embracing your awkwardness at this age allows for kids to feel comfortable in their own skin. A is also for Awesome. In the vernacular of those caught between childhood and adolescence that is the best way to describe this book: Awesome! of all, however, it is filled with wisdom that cradles the conflicting emotions of those having to endure middle school while simultaneously validating their right to claim their own identity. Like “Chicken Soup for the Soul,” this book is a primer designed to give hope, relieve fear, encourage expression and provide guidance for the journey through, yes, a very awkward time of life. It should be treasured by and carried in the backpack of every one who embarks on that journey! Olson Huff, MD is Founding Medical Director of Mission Children’s Hospital and the Olson Huff Center for Child Development. I am so proud of the students of AC Reynolds High School who wrote and illustrated this book designed specifically for middle school students as they live through adolescence. Often, during this age, students experience issues of bullying and social adjustments that they are unsure of how to deal with to have an emotionally healthy teenage life. The message of encouragement is positive, creative, and relevant. It is directed toward being proactive as a young teen to prepare to face the issues before they actually experience some of the more difficult times of these awkward years of transition. My appreciation and thanks to our students for having the compassion and insight to create this wonderful book. – Gerri L. Mattson, MD, MSPH, FAAP, is a Pediatric Medical Consultant with the NC Division of Public Health, Children and Youth Branch, North Carolina Department of Health and Human Services.